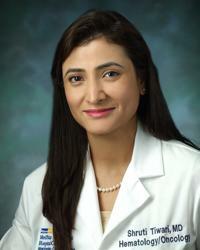 Shruti Tiwari, MD, is an attending physician at MedStar Washington Hospital Center/Washington Cancer Institute for the Division of Hematology and Medical Oncology and an Assistant Professor at Georgetown University. She is a member of the American Society of Clinical Oncology, the American Society of Hematology, and the American Medical Association. As a medical oncologist, Dr. Tiwari specializes in the treatment, prevention, and management of breast cancer through the use of chemotherapy, hormonal therapy, and targeted treatments. A comprehensive care team for breast cancer includes surgeons, radiation oncologists, medical oncologists, nurse coordinators, and genetic counselors. Dr. Tiwari is dedicated to collaborating with a team of doctors and nurses at MedStar Washington Cancer Institute to provide her patients with state-of-the-art treatment and access to cutting-edge clinical trials. Dr. Tiwari received her medical degree from the Pravara Institute of Medical Sciences in Ahmednagar, India. She then completed residency training in internal medicine at the University Hospitals Cleveland Medical Center via the American Board of Internal Medicine Physician Scientist track. Finally, she completed a fellowship in hematology/oncology at the Cleveland Clinic Taussig Cancer Institute before joining MedStar Washington Cancer Institute. Her research interests include exploring novel targeted treatments for HER2 positive breast cancer, triple negative breast cancer, health disparities, and patient reported outcomes. Additionally, Dr. Tiwari conducted research evaluating clinical outcomes in very small HER2 positive tumors, exploring the need for chemotherapy treatment in these patients. Dr. Tiwari is published in numerous peer-reviewed journals and has presented her work at national conferences on various occasions. “The reason I wanted to become a medical oncologist is to have the ability to provide care to patients that extends beyond their diagnosis. In order to help someone achieve the highest quality of life possible after receiving a diagnosis of breast cancer, it is essential to treat each patient as a whole. As human beings, we experience emotional stress, we have passions, and we are surrounded by loved ones. My team and I are here to provide state-of-the-art treatment to our patients and help them through the journey of cancer.